We just finished our 100 celebrity swag bag bracelets for the 2013 Golden Globes in Beverly Hills this January. We hope all the celebrities and press enjoy their new Golden Plume Agate and Quartz Statement Bracelets! Check back next month for photos from the event with the celebs. 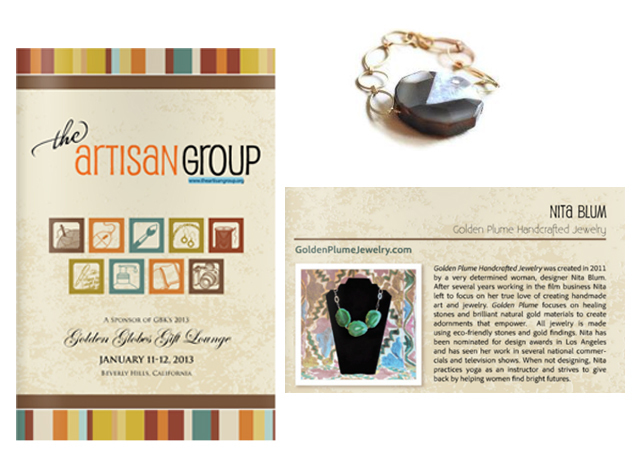 We’re pleased to announce Golden Plume Handcrafted Jewelry, in association with The Artisan Group, will participate in a luxury celebrity gift lounge hosted by GBK Productions on January 11-12, 2013 at an exclusive location in Beverly Hills, California, in honor of the The 2013 Golden Globe Awards Nominees and Presenters. 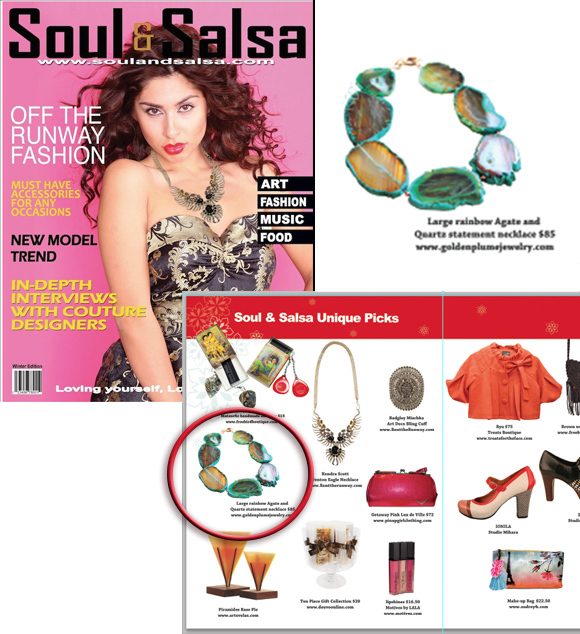 Our Emerald Agate and Quartz Statement Necklace will be prominently featured on display at The Artisan Group’s exhibit, and all attending celebrities will receive our Agate and Crystal Quartz Statement Bracelet in their swag bags. This event will also be attended by nearly fifty press and media outlets. To learn more about Golden Plume Handcrafted Jewelry and our products, or our participation in this exclusive event, visit http://www.goldenplumejewelry.com, call 323-559-1695, or email goldenplumejewelry.com. Nita Blum, Golden Plume Handcrafted Jewelry’s sole proprietor, is a resident of Marina del Rey, California. Posted in biz end, Celebrity Plume and tagged press release. Bookmark the permalink.